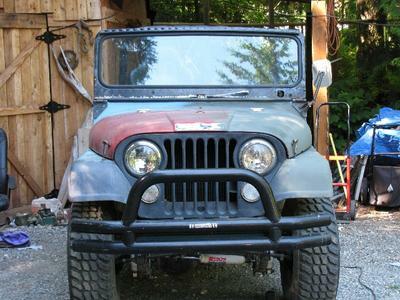 I bought this Jeep from the original owner in 1987, the year after I wrecked my 1973 CJ5. It had a blown motor with about 55,000 miles on it, and lots of carport time. Everything was original, including the owner. He told me it was a special Jeep. I just thought he meant it was special to him. It has the 225 Dauntless V6, original air filter cover, stock exhaust, warn overdrive, 3-speed transmission, and 4:88 rear end. I've had the engine rebuilt, as well as the overdrive, rear end, and transmission. It's got a 2 and 1/2 inch Rancho spring lift, Rancho shocks, and all new tie-rods. I've had the body off the frame, sandblasted the frame, replaced with all new body bolts and bushings, and had everything painted and undercoated. 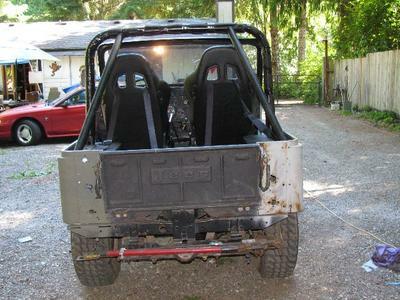 Rhino lined the whole interior and dash. Installed new off-road bucket seats with 4 point harness seat belts. It's got a new top and doors, and has diamond plating on the corners and under the doors. Installed a 3-inch Smittybilt tube bumper up front, and run 31 x 15 inch self cleaning tread tires. About all I have really left major to do is get the stock Robins egg blue paint job, and the renegade I decal. exhaust all the way out the back eventually. Right now the exhaust empties in front of the rear wheels. It did have the original Ramsey 8000 pound PTO winch but it was missing a gear so I traded it and the drive lines for some other work on it. I still have the stock rims, 4 of them at least, and the stock spare tire rack. Most of this was done almost 12 to 15 years ago, then it sat in my garage hidden under clothes and junk from my wife, while I played with R/C gas buggies for about 10 of those years. 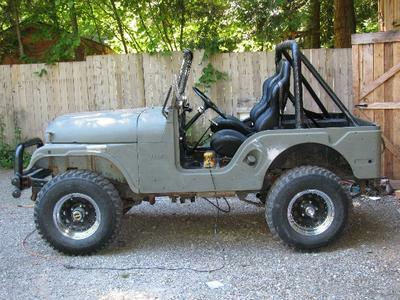 Then of course, just recently, I discovered just what the original owner meant when he said "It was a special Jeep". I guess they only made 200 or 250 of the Renegade I package that year? OOPs! I guess I should have left it stock after all. LOL! Oh well I'm 53, and I told my 23 year old son that it won't matter because they are going to have to dig a big hole to bury me in anyway! Lol. I'll send more pics as we make more progress. Larry's Comment: Hey Mikey, I like It! 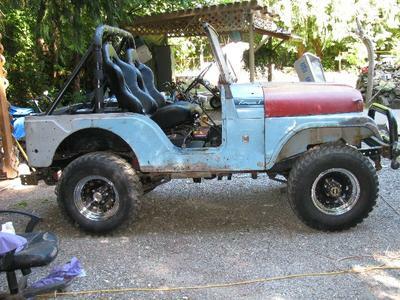 Great project CJ5. Your Jeep appears to be the 1970 Renegade I, which was the first year of the Renegade series that ran for 6 model production years. Look forward to updates. Thanks!